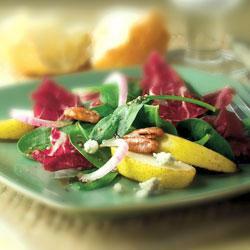 Description A blend of sweet & tart, this salad makes a beautiful start to a perfect meal. In small saucepan, heat vinegar and oil gently over medium heat until hot; immediately pour dressing over salad and toss until evenly dressed. Season with salt and pepper and serve at once. Lightly grease a rimmed cookie sheet. Set aside. In a small saucepan bring sugar and water to a boil. Increase heat to medium-high and cook syrup without stirring until mixture turns golden, about 10 minutes. Remove from heat. Stir in pecans, then spread pecans in a single layer on prepared sheet. Let stand until cool, then break into small pieces. Makes 1 cup. Store covered at room temperature.